Dazzling percussive beats… Gorgeous new melodies… the return of the incredible National Indian Music Youth Orchestra. Confluence is a coming together of some of the country’s most talented young musicians, in Samyo, with two unique collaborations with the supremely talented National Youth Jazz Collective and National Youth Brass Band of Great Britain. Featuring a wide range of classical Indian instruments, Samyo is known for its creative combinations of classical and contemporary styles, and for bringing this new generation of orchestral Indian music to new audiences. Performing music that combines North and South Indian music traditions with contemporary elements Samyo regularly showcase brand new compositions written especially by some of the world’s finest artistes including Bombay Jayashri, Shashank and Gaurav Mazumdar. 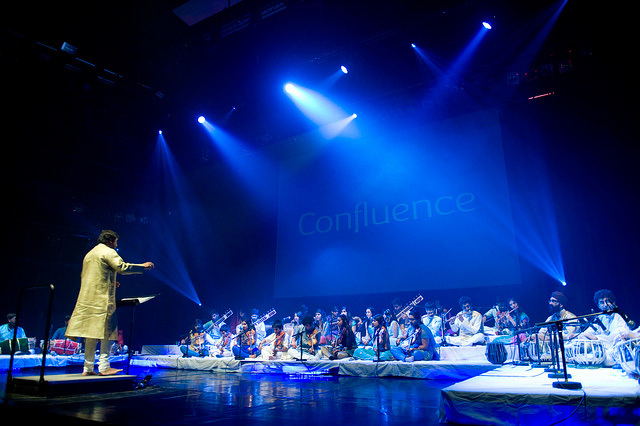 Prepare for an explosive performance that is sure to propel them to the forefront of the Indian Classical Music stage. Samyo is the National Indian Music Youth Orchestra. The orchestra exists to provide inspirational training and performance opportunities to talented young musicians of all backgrounds under the age of 18, who are trained in Indian classical music. The orchestra is a National Youth Music Organisation, supported by a fund from national charity Youth Music. Samyo was founded and is managed by Milapfest. National Youth Jazz Collective is a new and vibrant National Youth Music Organisation, funded by Youth Music and currently parented by the Foundation for Young Musicians. The orchestra is designed to support the creative and educational needs of the young jazz musician through regional outreach projects and an annual National Youth Jazz Summer School.